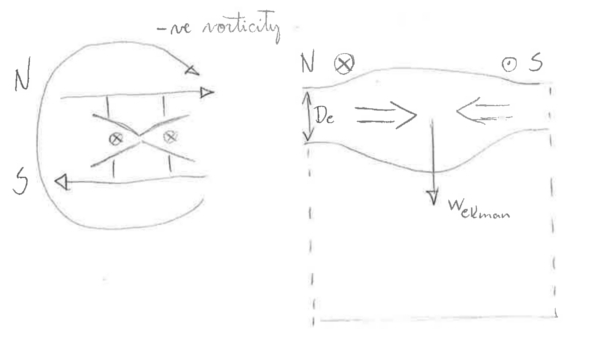 The last lecture we saw how conservation of potential vorticity governs the evolution of flows in the ocean. What can we learn from vorticity about the steady, large-scale circulation using vorticity? Sverdrup combined geostrophy with Ekman dynamics to find a powerful relation for the size and pattern of ocean's circulation in response to the winds. 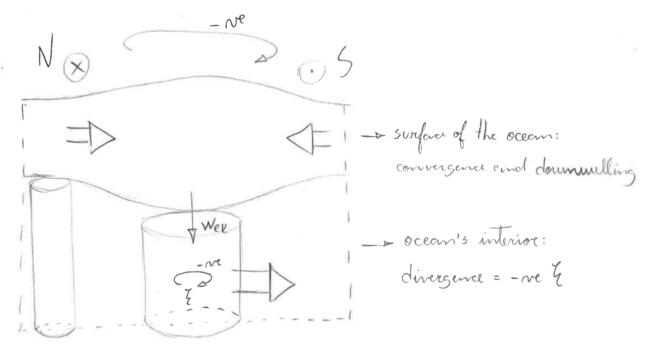 We are going to derive Sverdrup's balance by first considering the geostrophic interior and the frictional surface boundary layer (Ekman layer) separately, in order to highlight how these two regimes couple to form an ocean gyre. 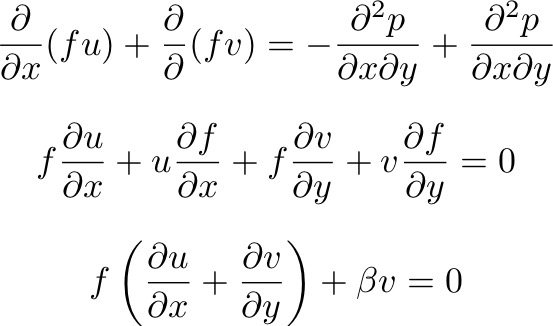 Thus, β << f except near the Equator. So, the divergence of the flow is proportional (at any latitude) to its northward or meridional velocity. How can that be? Remember last class, if you change the thickness of a water column over a rotating sphere, it will need to change its spin to conserve PV. If ζ << f, then the water will move north/south! With boundary conditions w(zbottom) = 0, w(ztop) = wtop. Here, zbottom is the seabed and ztop is the top of the geostrophic interior. For w(zbottom) = 0 we are assuming a flat-bottomed ocean. Thus, at any latitude, the meridional transport is proportional to the vertical velocity at the top of the geostrophic ocean. 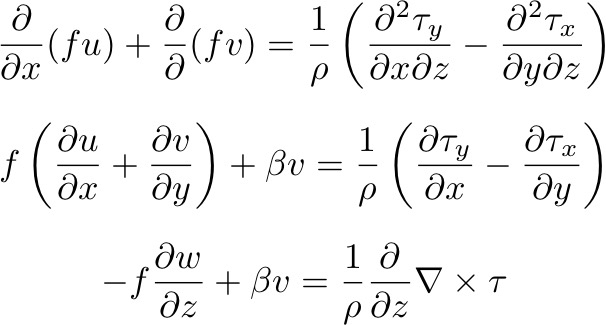 Conversely, for anticlockwise winds, the Ekman transport is divergent and the vertical velocity is upward. This is called EKMAN SUCTION. We can combine the Ekman and geostrophic layers very simply by looking at the two vorticity equations we have. - wbottom is small - "flat bottom assumption". (1) A surface layer where the curl of the wind field drives convergences and divergences which drive vertical flows (or changes in layer depth). (2) An interior, geostrophic layer driven by the vertical flows (Ekman pumping/suction) that result from divergent/convergent Ekman transports. This depth-integrated balance drops the details of the Ekman layer + geostrophic interior physics, to give us the (deceptively) simple result that the WIND STRESS CURL DRIVES THE MERIDIONAL TRANSPORT. - clockwise (negative) wind stress curl: southward transport. - anticlockwise (positive) wind stress curl: northward transport. In terms of vorticity, you can think of it as the input of vorticity from the wind being "stored" in the ocean by moving a column of water to a region with higher or lower planetary vorticity.